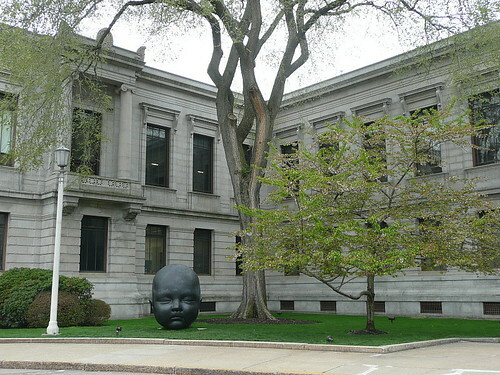 I’d love to think at least one of the giant bronze baby heads planted outside the Huntington Street entrance of the Museum of Fine Arts in Boston is dreaming of trees. 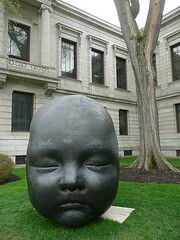 Titled “Day and Night,” the installation was sculpted by Spanish realist Antonio López García and consists of a pair of bookended baby heads: one awake, the other sleeping. Today, both heads were showered with windblown crabapple blossoms. If you, too, wish to dream of trees, click over to 10,000 Birds for this month’s installment of the Festival of the Trees. 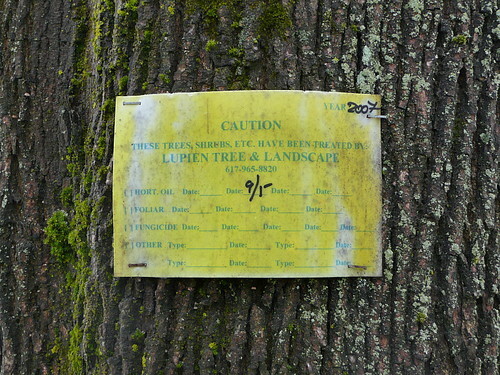 There you’ll find enough tree-related links to keep your eyes wide open. 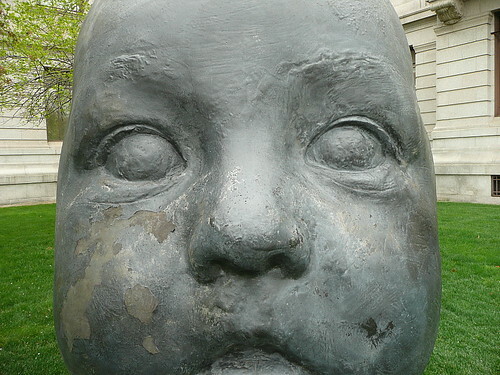 Click here for my photo set featuring Antonio López García’s big babies. You can see their conception here and installation here. Enjoy! Yesterday, it was the shoe-fruits of London. 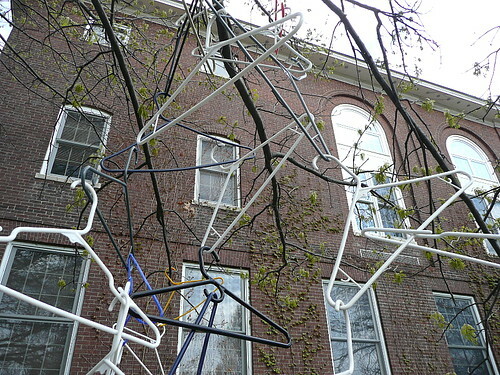 Today, it’s the coat hangers of Keene. What do you think will start growing on trees tomorrow? 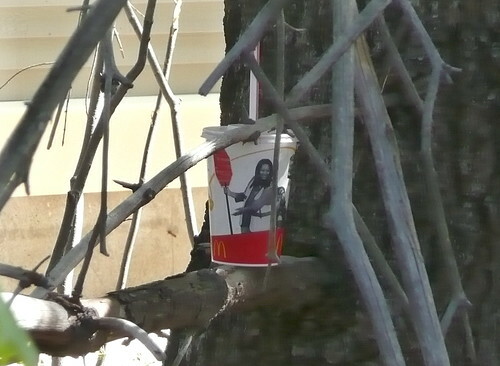 With all the spring sun we’ve been getting in New England these days, even the trees are thirsty, sneaking surreptitious sips of high fructose corn syrup in the form of McDonald’s sodas. Either that, or “leaf litter” isn’t the only kind of dry detritus you can find in the woods in springtime. Last week in Keene, we had our first fire warning of the season: a reminder that low humidity and dry leaf litter make for dangerously flammable forests. 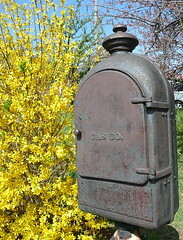 This weekend in Waban, the “fire” outside is metaphoric, with forsythia blooming like a yellow-hot blaze in suburban yards and gardens. Although I mentioned Earth Day earlier this week, yesterday I was remiss in remembering Arbor Day. Steve was similarly remiss, mentioning today that he’d forgotten both Earth and Arbor Days, presumably because he was “not watching the calendar closely enough!” For good or ill, neither Earth nor Arbor Day is on my calendar, but I’d like to think that doesn’t matter: wouldn’t it better for us (and the health of the planet) if we spent less time watching our calendars and more time listening to trees? Apparently he intended to write a comprehensive history of the natural phenomena that took place in his hometown each year. 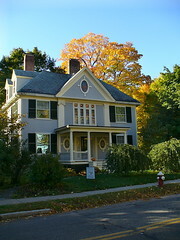 Although he planned to base his natural history of Concord upon field observations recorded in his journal over a period of several years, he would synthesize those observations so that he could construct a single “archetypal” year, a technique he had used to wonderful effect in Walden. In my neck of the woods, I’ve learned, trout lilies bloom at the end of April, and forsythias flame not long after. I don’t need a calendar to remind me of that fact, just my blog (the 21st-century, high-tech equivalent of Thoreau’s journal) and photo archives. Next week, I’m hoping the wake-robin (Trillium erectum, also known as purple or red trillium) will be blooming since I have an unofficial ritual of blogging them on May 1st, whether at Goose Pond or Beech Hill. After May 1st, I’ve learned from years of New Hampshire living, the black flies will emerge, and my days in the woods around Keene will be numbered, at least until blood-sucking insects die off. 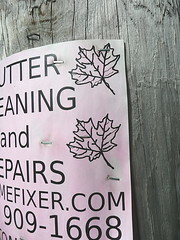 It might be true that the trees of the greater Boston area are fond of McDonald’s soda, but I’d prefer that instead of “loving it,” they simply leaf it. Steve rightfully notes that every day should be both Earth and Arbor day, for “When should we not be thinking about trees, about the health of the planet?” Between you and me, I think the trees in New England and elsewhere would be healthier if they just said no to soda. Second, don’t forget to submit your tree-related links and pictures to next month’s Festival of the Trees. You can send permalinks to mike (at) 10000birds (dot) com, submit them via the Contact page at 10,000 Bird’s, or use the Festival’s online submission form. The deadline is April 29, so get moving! Noticing is addictive. Once you see one tree silhouetted against a building, you start seeing shade trees–the upright ghosts of living trees outlined as shadows on nearby vertical surfaces–everywhere you go. I’ve talked before about color-collecting, the practice of choosing a particular color (say, red), and then taking a walk in which you try to notice every instance of said color (a stop sign, a passing jogger’s hat, a parked car, a cast-off Coke can). The first time I talked here about color-collecting, I reasoned “If we’re going to travel the territory of our mundane lives, we might as well notice the neighbors.” Now nearly four years later, I find myself nodding emphatically to my own argument. What better way to make yourself at home in your environs than by getting to know your neighbors, both the actual trees you meet and the ghostly shades they cast? 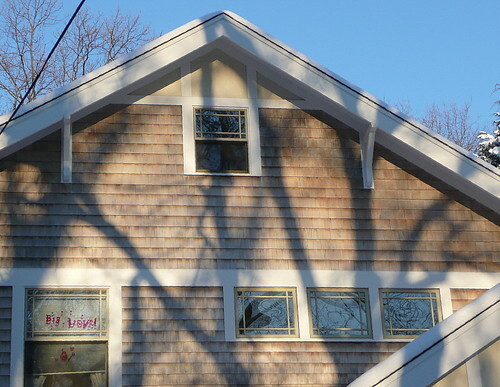 I took today’s photos last weekend, and over the intervening days, I’ve been seeing tree shadows everywhere: on buildings, on cars, on fences, on other trees. The natural place for any shadow to lie is on the ground, shade gravitating like water to low places. 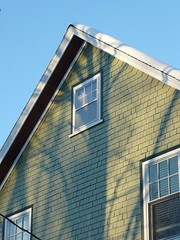 But in a forest of trees or a suburb of houses, there are many available objects to catch any given shadow. Presumably any of these shades would prefer to lie lazily on snow-blanketed ground, but instead, they’ve been snagged on verticality. Can you imagine the courage of an east-facing facade that stands unmoving even while knowing the weight of a shade tree will fall upon it every sunny morning? In the summer time, these shade trees are shapeless and amorphous: dark blobs that bespeak the leaves of others. 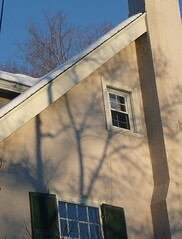 In a snowy season, shade trees are stripped skeletal, the shadows they cast tracing their inner anatomy. In summer, we see superficially, lulled by the loveliness of leaves; in winter, all that gets cast away like so many veils, and we see (truly) what lies beneath. Some say shadows are unreal, the lingering after-affect of light and enlightenment. But why should we privilege the cause over the effect? Once a tree has grown, we have no use for its now-split seed; once we’ve reached our own adulthood, we’re discouraged from behaving as babies. 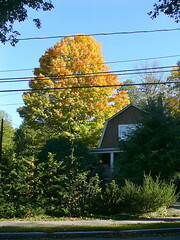 Leaves are arboreal flesh, branches arboreal bones, and tree shades arboreal spirit. 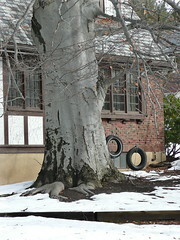 If over-arching trees add value to shady suburban homes, why wouldn’t the winter shadows these same tree cast be likewise prized? 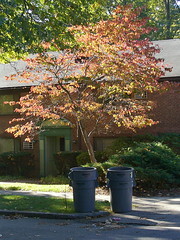 Click here for the complete photo-set of shade trees. And while you’re collecting all things arboreal, click over to the March 2008 Festival of Trees, currently hosted on Orchards Forever. Enjoy! It’s a New Year, so what better way to celebrate the 19th edition of the Festival of the Trees than by looking back on the trees that were. Marja-Leena offered an arboreal version of the year in review by posting the trees of her year. In a similarly retrospective vein, Granny J shared images of dead and dying cottonwood trees, and sarala touched on another kind of arboreal loss in a review of John Vaillant’s The Golden Spruce focusing on the tragedy of North American deforestation. While we’re on the topic of deforestation, Kilroy has moving (as in video!) proof of how professionals topple trees without destroying nearby buildings (or crushing nearby video-bloggers). And if loggers are going to fell trees to make paper anyway, Julie Dunlap reviews a handful of books about trees that belong on any tree-hugger’s shelf. Trees felled by age, storms, and even foresters’ axes are one thing…ornamental trees attacked by college students are another. 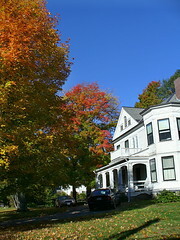 Here in New England, December, 2007 began with news of an arboreal hate crime masquerading as a college prank. You’d think that in the typically tree-hugging People’s Republic of Cambridge, Massachusetts, college kids would be more “green”…but apparently Ivy League pranksters have no particular fondness for Japanese maples and crabapples. 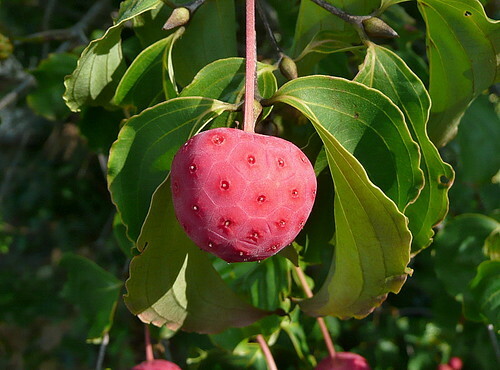 An article from the Boston Globe suggests, though, that it may be unnecessary to be kind to individual trees in an age where we can genetically design their replacements. 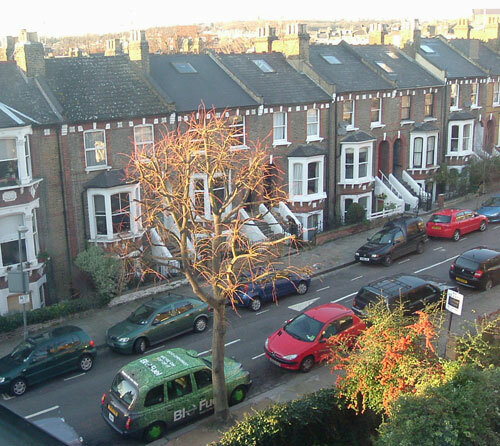 O brave new world, that has such trees in’t!. 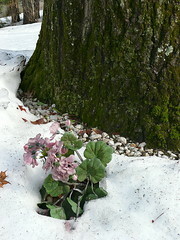 Poised on the cusp of several seasons, December was an image-rich month for trees in the blogosphere. 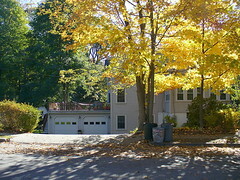 Fotokew shared an image of lingering autumn leaves, Anthony McCune shared the secret (or perhaps we should say squirrelly) lives of trees, and Arboreality shared images of snow while educating us about the annual phenomenon of leaf marcescence in oak trees. Dr. Omed’s Tent Show Revival continues to be a source of inspired images, first a pair of pictures showing burr oak parts (the second of them looking enough like a Buddhist mudra as to make for an apt arboreal altar icon), and next a series of Tulsa trees toppled by an ice storm. Wandering Around Kansas also illustrated the effects of ice storms on trees, and CBS News featured video on efforts to save the “Survivor Tree”–a nearly century-old elm that survived the Oklahoma City bombing–from similar ice damage. 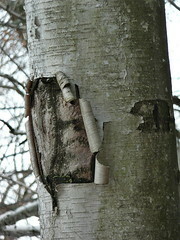 Elsewhere in the December blogosphere, 3rd House Journal shared pictures of New England birches while Jean Morris featured the same species across the pond; Jean also blogged a photo-mosaic showing a tree’s twiggy complexity. Similarly breath-taking (or breath-inspiring?) are FrizzyLogic‘s images of solstice tree moments, and Kim Nixon shared a similarly lovely moment in mist woods. Trees serve as the literal backdrop of several closeup images of bracket fungus appearing on A Passion for Nature. 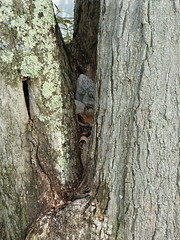 In the category of “trees over time,” A. Decker blogged a series of images showing the many moods of two trees. Through the deft wielding of an artist’s pencil, Ester shares the shaded nuances of a couple of bonsai trees. 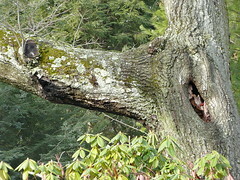 Urban Extension featured a trio of tree posts: two about otters and oaks, and a third about an ancient walnut. 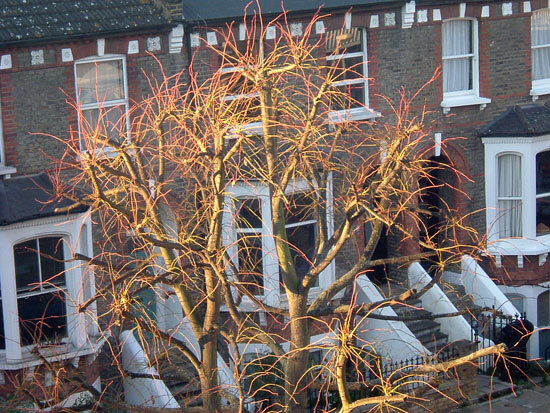 December is a bittersweet time for trees. Denuded of fall foliage, deciduous trees here in the Northern Hemisphere are no longer the focus of visual attention; featured in holiday celebrations, evergreens typically have to die to become decorative. QAZSE laments the violence inherent in the Christmas tree harvest, and other bloggers suggest more eco-friendly alternatives. Here in New England, the village of Waban features a live evergreen as its Festive Holiday Tree…and Universal Hub posted an image I’d snapped of this same tree reflected in a puddle of snowmelt. Elsewhere, bloggers snapped images of other creative re-interpretations of the traditional Tannenbaum. The Jersey Exile, for instance, shared an image of a Gloucester Christmas tree made from lobster traps while Blaugustine posted two pictures of a live urban tree bedecked by sunlight for the holidays. (I can’t seem to permalink directly to Blaugustine’s two relevant posts, so you’ll need to scroll down…or click here and here for pictures alone). Evergreen mortality notwithstanding, Jim Hession shared the frustration (shared by many of us) of erecting the perfect Christmas tree. And when it comes to perfect Christmas trees, GrrlScientist posted proof that New York City’s Lincoln Center Christmas tree might take the prize, at least by night. In the realm of poetry, Dave shared translations of five tree poems from Renaissance Spain, which struck me as being both tree- and mother-centered. 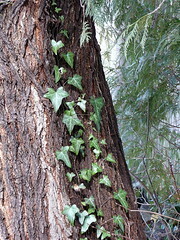 Apparently if you Love Your Mother (whether she be Mother Earth, the Virgin Mary, or dear old Mom), loving trees is a natural corollary (a lesson lost on certain Ivy League pranksters?) Kim Nixon compared the hurt of poems not making the cut to the woodpile left in a tornado’s aftermath. 3rd House Journal illustrated in words and pictures the connections between trees and neural networks. And Beloved Dreamer shared the sense of loss and longing evoked by a memorial wreath fading at a crossroads: even evergreens eventually point to mortality. There are real trees, there are trees in our dreams, and then there are trees that take root in both worlds. Karen Dowell shared the rich folkloric history of the rowan tree, also known as mountain ash or caorunn. 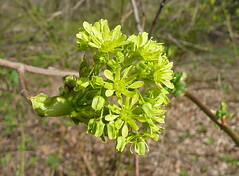 Terry* featured an article by Nalini M. Nadkarni on unsung arboreal heroes. 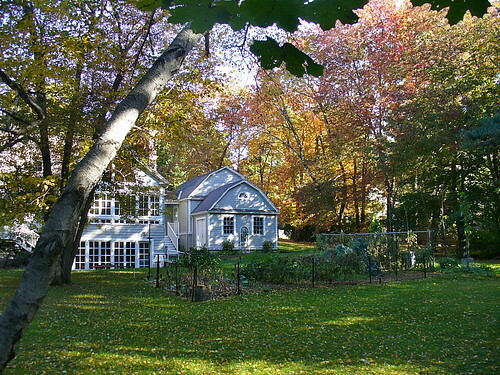 Pat Doyle explored the Feng Shui connection between trees and spiritual healing. Artistic Journeys has featured an ongoing re-vision of the traditional Tarot deck, many of the cards depicting trees such as this image of strength. In the realm of American history, EHT of the American Presidents Blog shares the story of Presidential trees…and the connection between Presidents and trees goes far deeper than that legend about George Washington and an ill-fated cherry tree. And blogging from Malaysia, Lye Tuck-Po recounts the transformative experience of entering a rain forest for the first time. In the natural world, the mythic one, and the histories that transpire in between, trees loom larger than life. That’s a lesson we can carry from any year into the next. The February, 2008 festival of the trees will be hosted at Ginkgo Dreams. Please send any and all tree-related links to kelly (at) ginkgodreams (dot) com with “Festival of the Trees” in the subject line, or use the automated submission form. The deadline for February submissions is January 29.